The Lego brick is getting more and more practical applications by the day, International Robotics has developed individual, colored neon letters, numbers, symbols, and punctuations, which reside within transparent, fire-resistant, plastic casings that snap together like Lego blocks to create a word or a phrase of your choosing. 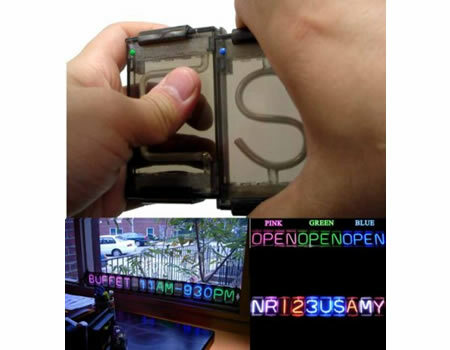 So after playing around with the blocks for the text of your choice all you need to do is connect it to a special power source and you have a low-voltage, recyclable, neon-sign which lasts for 10,000 hours. A relatively cheap solution – less then $5 a block and $30 for the power supply, new NeonClick signs can always be recreated using blocks from your dismantled sign or by purchasing new individual blocks to complement your stock. The blocks are connected in parallel so if one letter goes down the others will function and only the faulty block needs to be repaired. The blocks are available in various sizes and come in three colors Green, Pink and Blue. Here’s a simplified way to snap yourself together a quick neon sign. Connect the first module to the $30 power supply, and string together whatever catchy phrase you wish in your choice of pink, green or blue letters or numbers….